It may seem impractical or even illogical that buying an additional set of tires for a vehicle could actually save you money in the long run. The cold, hard truth? Winter tires can indeed be a good deal over the lifetime of a vehicle, but they must be employed and maintained properly. The facts below will outline why Park Muffler’s endorses quality winter tires. There’s no question about it, friction with the pavement is what makes your vehicle go– no matter how much horsepower you have. Snow, ice and slush can easily remove this friction, leaving you without the ability to accelerate or brake effectively. 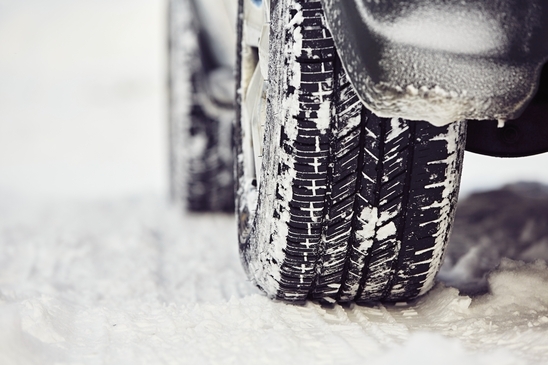 Winter tires are designed to maximize your vehicle’s grip, resulting in improved results across the board. Prevent costly collisions with tires that allow you to operate a vehicle more safely and confidently. One argument against winter tires is you may lose money because they are not effective in other weather and may need to be swapped out more than twice per year. In the Edmonton area, this simply does not ring true– our winters are easy to predict with consistent conditions. Also winter tires are equipped for more than just snow: their softer material is effective from 7 degrees Celsius and below. One trick is to install your winter tires when you can see your breath in the mornings! Just be sure to switch to summer or all-season tires in the spring, as winter tires can degrade in warmer weather. Balance and rotate your winter tires as you would any other kind of tire and try to replace them all at once for best results and even wear. Check the inflation level of your tires at different temperatures, depending on your day-to-day parking and driving habits. Always have leaks repaired promptly and make note of any damage or defects in the tread. If you follow these simple steps, you may get twice the lifetime out of both sets of tires. If you have any questions or concerns about winter tires, don’t hesitate to contact the experts at Park Muffler — call, email or visit today!